A fun Karting Dads podcast episode about how being comfortable on track or being in a safe place with your driving or your kart is generally slow. Do share your feedback or similar experiences with this subject and hope you enjoy it. Get in touch at www.kartingdads.com or find us on Facebook as Karting Dads. Episode 32: Special guest Jorge Ruiz! Hey ladies and gentlemen! welcome back to another episode of Karting Dads! Here we have a very good friend of ours Jorge Ruiz. He just won the championship with SKUSA in the 206 class. He has been al long supporter of ours and was so happy to have him on the show. Please continue to follow us at www.kartingdads.com or on facebook at Karting Dads as well as Jorge Ruiz with Jam racing on facebook!! Thank you again everyone for your support!!! Episode 31: Race recap pt.2 and testing goals! Welcome back to the Karting Dads Podcast. In this episode, we wrap up the race recap from last week and discuss some testing goals for the upcoming week. Please continue to follow our podcast on our website www.kartingdads.com and on Facebook at Karting Dads! In this episode, we look at failures, mistakes, and minor oversight that resulted in lost track time. Some were just human error, others were items we didn't have on our karting checklists, but have since corrected. 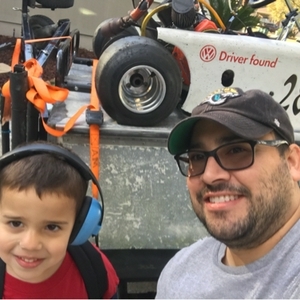 Hope you enjoy this episode of Karting Dads podcast. Visit kartingdads.com for more tips and resources. Hello everyone and welcome back to the show. Man, do we have a big announcement to make. This is something to help get people come join us for not only for our club but our local races. We go over a race recap that we had and the problems and good times that came with it. Please continue to spread the word about our show and thanks again for listening!!! We're baaack! We talk about our experiences and lessons from 2018, and plans for 2019. Check us out on www.kartingdads.com or Karting Dads on Facebook. Hello and welcome back to another awesome episode of Karting Dads. Man, this episode was a whole bunch of fun. I have on a great friend, world wide known as, Miguel Ruiz. I am honored to have him as my first in studio (lol) guest. Hope you enjoy this episode. There is no editing or filters, its just us having a blast as we would talk at the track after a race day. Enjoy and please continue to spread the word about our show!!!! Episode 24: Wow! Great racing 2 classes with bunch of friends and our own group trophy!! Welcome back to another episode of Karting Dads! We traveled again to Ocala Gran Prix. We decided to run 2 different class in 206 senior medium/heavy and also 206 masters. Action packed weekend. Grateful for all our friends who help us out. This weekend was blast and now we have also created our own trophy for bragging rights! Episode 23: Big track+206=Awesome time!! Welcome back everyone!! In this episode we talk about road racing a LO206 at the lovely Roebling Road with the Southern Kart Club. This was such an awesome event and had a blast hangout and racing with our friends! Thanks again for following our show and continue spreading the word about Karting Dads! Episode 22: Our first ever interview. Special guest Kelly Smith! Episode 21: Pay attention to the flag! Flags are extremely important to all driver safety and they should be followed. There is no excuses with drivers and race directors in karting not enforcing these rules. Episode 18: Is your checklist holding you back? Welcome back to another episode of Karting Dads! Are you stuck in a comfort zone? By this, we are talking about being unable to lower your lap time no matter what you try. The track is the same speed, your vision isn't getting any faster, and you can't push yourself to find that extra 0.5s? If so, then tune into this episode. We took advice from Ross Bentley's Speed Secrets Podcast on "how to slow down a track". We are not talking about overall lap times, just how to slow down a turn by driving something faster! We would love your feed back on any experience you have with this! Episode 16: Karting Tip! Wheel hop causing a problem? What's up everyone! We had a blast this weekend with some friends. We also had a "paradigm shift" in karting that really made us very happy. We talk about SIM racing and what might be happening in the karting community and a great time we had learning at the track. We met up with some great friends that tried out our karts and got a lot of good info. Emmanuel was a beast and went 70 laps non-stop. Jorge Ruiz went 40+ as well. Things were great. 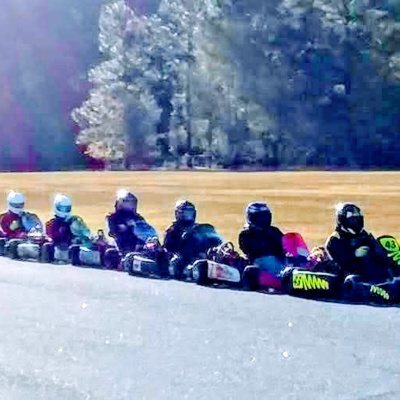 We are looking forward to having another KartingDads weekend when we can get a lot of people to come hang out, cook food, drive the track and socialize. Thank you again to everyone who follows the show! We could not thank you enough! Hello everyone and thanks for listening to our show! In this episode, Emmanuel went to PBIR to run his E30 and perform his NASA FL duties. There was a comp school going for drivers looking to go wheel to wheel racing. While all this was happening, he also took his little girl with him and she roamed the pits and the tower. I, on the other hand, had my son's birthday party. Here, he received his first go kart!! He was excited for sure. We also talk about some upcoming events that maybe you can come hang out with us at and have some fun! Thanks again everyone for your support! Hello and welcome back to another awesome episode of Karting dads! I recently have purchases a kids kart for my son. We go through the process of buying a kart as well as all of the safety equipment that goes with karting in general. Hope you enjoy!! Episode 11: OGP is in the books! We are back!! In this episode we talk about Ocala Gran Prix. We had a blast meetings some new friends as well as meeting some followers of the show! Wow! is the only word I can think of as the race weekend comes to end! Thanks again everyone and please tell all your friends about this show! Follow us on facebook at Karting Dads for pictures of the event! Episode 9: Struggles of learning a new kart and FINALLY the E30! Struggles of learning a new kart and FINALLY the E30! Episode 8: Oval and sprint karts can race together!! Discussing an amazing race weekend with the Florida Asphalt Oval racing series at their combined event with our local club race. Help from a national champion driver/coach!! Review from the local race and the problems that came along. Also learned alot from the mistake in prep that happened. We talk about some NASA racing, AKRA's upcoming events, and the some tips from Speed Secrets podcast. Karting Dads podcast hosts Emmanuel and Andrew discuss some of our struggles and joys of karting. Episode 3, NASA, dirt karts, our skills vs local comp! Karting Dads podcast episode 1 . Our first big event with the Maxxis 4-cycle Asphalt Sprint racing series.